London College of Creative Media (LCCM) is proud to announce that it has sealed a partnership with drum manufacturer TAMA and cymbal manufacturer Zildjian. This new collaboration has two core aims. Firstly it ensures LCCM students perform and practice on the same kit used by professional musicians and secondly it will enable LCCM to hold regular master classes and clinics with TAMA or Zildjian artists. The equipment includes seven Starclassic Maple Kits, TAMA Star Walnut Kit, five S.L.P Snares, three Starphonic Snares and cymbals of K Custom, A Custom and Avedis A series. The drum kits and cymbals provided for LCCM represent the high-end lines of the brands and are widely recognized as such by top music industry professionals including Pete Ray Biggin from Level 42 and Eddy Thrower from Lower Than Atlantis. The significant investment into new facilities and equipment at LCCM will help students to develop and refine their musical skills to become the pro-players and great artists of the future. Ian Aguado-Bush, Product Manager at TAMA and Zildjian said: "We recognise LCCM as one of the leading and progressive music institutions in London. TAMA and Zildjian has always been focused on education, which is why we are very proud to be partnered with LCCM, where students can play and experience our very top level of drum kit. We believe that the college will benefit from advanced learning with the new equipment provided." LCCM offers several drum courses including its BMus (Hons) Music Performance and Production, where drummers can study Music Production alongside their drum lessons. "We are dedicated to nurturing the professional development of our students at LCCM. We want to ensure that every person who studies with us gets the knowledge, skills and networks they need to build the career in music they want. 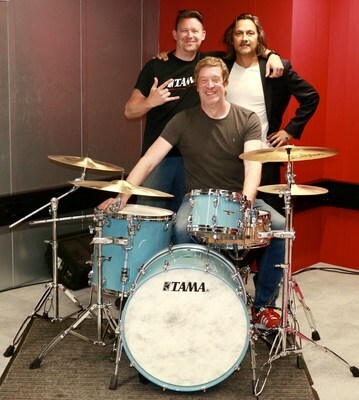 Our students and teachers have applauded the new partnerships with TAMA and Zildjian for helping to take the kit and facilities at LCCM to the next level," said Richard Brook, Subject Leader for Drums at the London College of Creative Media. "The mission of our partnership is to provide professional instruments and support for LCCM students. We think that this collaboration fulfils the needs of the college and gives the students tools to deepen their learning and growth in the classroom, and on their own in the practice room," commented Bob Wiczling, International Marketing Manager at Avedis Zildjian Co.
LCCM was founded in 2002 as a music college. Its aim was to establish a new approach to teaching music that mixed an art school environment with the best of the music conservatoires and universities. Since then it has grown into a college for music and other creative subjects in the centre of London. LCCM pioneered an educational model where music students had to master both performance and production - a combination that remains vital for most professionals today. With its degrees developed and delivered by leading industry professionals, the educational philosophy and principles underpinning the college have been extended to courses in, writing, entrepreneurship and coding. This innovative approach to specialist education prepares students for industry and employment from the moment they start at LCCM. Hoshino Gakki began manufacturing drums in 1965 under the name 'Star Drums'. The drums were manufactured at Hoshino's subsidiary, Tama Seisakusho, which had opened in 1962. By 1974, Hoshino decided to make a concerted effort to make high-quality drums and hardware and start marketing its drums under the TAMA brand. TAMA is now renowned for its level of craftsmanship and attention to detail, which is why it has become a leading brand among the drumming community. As the world's leading maker of cymbals, drum sticks, and percussion mallets, the Avedis Zildjian Company has been synonymous with setting the standard for the development and manufacture of high performance musical instruments since 1623. From the beginner to the world's greatest rock stars, jazz performers and concert percussionists, musicians of all backgrounds and experience levels choose Zildjian to allow them to experience and share the joy of music. Inherent in this, is Zildjian's passion and commitment to music education. For decades, Zildjian has supported music programs around the world and is proud to announce a new partnership with LCCM to offer new drummers access to an entire range of world-class products and resources that will allow them to best experience and share the joy of music with others.